The Online Soft Landings Project explores project stakeholder communications for UK construction projects, at different stages of the Soft Landings process. In particular we've been working on the potential deployment of 360 imagery to enhance stakeholder understanding and capture contextual communications to comment, feedback, agree or other action. 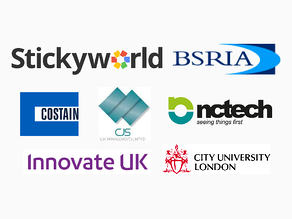 We're grateful for the collaboration of the following project partners: BSRIA, COSTAIN, CJS Events, NCTech Imaging, and supported by City University and funded by InnovateUK. The project runs November 2015-July 2016. We expect to launch new features from Octoner 2016. Request a call to learn how this can impact your project. Smarter stakeholder communciations to involve your clients and end users. In November 2015 we started a new research project called "Online Soft Landings". Working with industry partners including BSRIA, COSTAIN, NCTech Imaging and CSJEvents, we are exploring the feasibility and capability for online stakeholder communications tools and digital media such as 360 photography,video and imported BIM content to support what is becoming a common process deployed in UK construction projects to deliver better outcomes for clients and end users. Government Soft Landings is a version of the same process, and a mandatory requirement in procurement of all centrally funded buildings by April 2016. It is believed that as the process shows its fiscal benefits to clients in reducing waste in energy, operations and misaligned briefing, the rest of public sector and private sector projects across the AEC industry will follow suit. This feasibility research project is part funded by InnovateUK and will complete in July 2016. We are exploring ways to improve communications between design team, contractors, suppliers, clients and end users in the design, construction and operation of buildings. We are looking at Stickyworld's existing toolset, specifying and testing new tools, alongside content such as 360 photography, video and BIM content imported to Stickyworld's software. Stickyworld leads the project. We are collaborating with BSRIA, COSTAIN, NCTech Imaging, and CJS (UK Management) Limited and grateful for everyone's expertise. We are developing different 'room types' on our platform to support the different stages of the process. This includes from briefing rooms - where organisers will be able to crowdsource, analyse and export lists of user requirements at the outset of a project, through to post occupancy evaluation rooms, where organisers can host forums and run surveys about the completed building, all saving on traditional costs of capturing these insights. The project is helping our team focus on supporting full project lifecycle uses for the Construction sector, but there will be technoligy developed and released to all which benefits any kind of complex design project with multiple stakeholder. There is much in common with our Digitising Custom Build project, although that has more of a focus on marketing and sales involvement, whereas Online Soft Landings is definitely grounded in architectural design and building construction processes. If you are not a member of the BSRIA user group, there will still be other ways to get involved and shape the project and test some of the software, so do get in touch. We'll post links and more news in our blog in due course so signup for the newsletter below. If you want to email us direct use "Online Soft Landings" in the subject line to express your interest and we'll get back to you.